Now 23, Ms. Kramarik was a child prodigy from Illinois, U.S. who had finished painting Jesus when she was all of 8. The portrait of Jesus famous as "Prince of Peace" went on to establish her as a wonder child. Mind you, she had no formal training. All she had was her ‘visions’. Hers is a story that bewilders and fascinates many. Ms. Kramarik was 5 years old when on a rainy spring day, she had mysteriously disappeared. Her parents were frantic, of course, and pleaded to all to find their missing child. Police were called, her photograph distributed in the community, the search party was formed, all cars moving in and out of her hometown were checked. But they found nothing. You might wonder what is so mysterious about a 5-year-old who probably must have playfully wandered off into the woods chasing a rabbit. So, this is what is strange. Ms. Kramarik says during this entire period when people were trying to locate her, she was always around them, just invisible. “I was able to see the exact number of search and rescue people, and all the vehicles and families looking for me from above, and that I was seeing everything in detail on many dimensions at the same time”, Ms. Kramarik tells me in response to the interview questions that she so graciously agreed to answer. Her visionary experiences began right after this incident of her mysterious disappearance. Though her early life was spent sans any religious influence, she suddenly started to talk about god. ‘Prince of Peace’, the painting that propelled her into the limelight, was born of these very visions. “My visions were intense and vivid when I was a child, but I did not have either patience or ability to paint them. At eight there was a transformation in my perspective of life. My visions returned, and so did my passion for art. Jesus to me was a symbol of hope. The film ‘Painting the Impossible’ describes the details of the story”, she explains. Did these visions scare her? After all, she was really little when she began experiencing them. “Most of them inspired me and grounded me, but there were a few that shocked me”. She shared her visions with her mother who at first thought they were just dreams. Only later when Ms. Kramarik’s vocabulary improved and she could explain her visions better, did her mother realise that her daughter’s visions were beyond mere night dreams. “Nobody else apart from my mother understood what was happening “, she recalls. Some of her creations hold a special place in her heart. " 'Sixteen lives in the wind' and 'Jesus' were the most emotional pieces." She painted ‘Sixteen lives in the wind’ for almost a year in three continents and describes the experience as “intense artistic journey”. 'Sixteen Lives in the Wind' went on to sell for $180,000 USD, her most expensive painting till date. Her other favourites include 'Jesus', 'Lillies of the Valley', 'The Dreamer', 'Jesus', 'Metamorphosis', 'Immortal', 'Today'. She likes to paint when the world sleeps, between 3 am to 7 am. “I feel the most inspired and focused that time”, she notes. She has just signed and finished her latest painting 'The Dreamer'. 'Coincidentally, this is about India', she tells me. Another of her great works, 'Enlightenment' is about a Hindu monk who traveled the world to meet her. “India has not only a market for art. India is art”, she feels. Her great liking for India resonates in her words. “Its history and its people, its dreams and its spirituality, its ambitions and its astounding innovations and breakthroughs in every aspect of life are one of a kind. There is no country like India, and it will never be”, she goes on to say. What inspires this young mind, what motivates her and keeps her going, I am curious. “My inspiration has been and still is life itself. Visible and invisible life. Busy and serene life. My guidance has been my God, and my family”, she explains. She has lived in 15 different countries and has drawn from her experiences in creating her art. “Every city and village, every hut and palace, every forest and sea, every peasant and government leader I met is today in my paintings. Literally, under layers of paint,” she says. Ms. Kramarik’s faith and beliefs were moulded by direct visions and experiences of Jesus, heaven, and angels that began at a tender age four. At 23, she remains an ardent follower of those beliefs. She is young, talented, famous and yet simple and grounded. She says she is thankful to her parents who kept on reminding her that “purity and humbleness were the most significant foundation” for her growth as an artist. For all her success, she is painfully media shy. “I did not like any attention from media. And our lifestyle in the family did not promote pretentiousness and vanity”, she adds. The only reason she managed to be at ease at ‘The Oprah Winfrey Show’ was that she did not know how empowering and famous Oprah really was. It was this interview that declared her arrival to the world. “The interview caused a domino effect, and hundreds of journalists from around the world wanted to know more about my story and my art since”, she mentions. What does a woman with such intense thoughts do when she is not creating art? Ms. Kramarik helps her family out with farm work when she is not painting. She also cooks, rides her bicycle around or simply observes people during her free hours. If this does not reflect the simplicity of her life, I don’t know what else does. “I practice being one with God. One with the Truth and one with peace and love. God is part of everything we do. It is inseparable from life. I am conscious of divine presence every moment. It is a gift that keeps on growing and multiplying”, her words underlines her sentiment. Through her art, she wants to bring hope and peace to humanity. She had once said, “If I have been gifted by God, and I have been, it is for one reason only, to help others.” She is involved with several charities and wishes to donate her all free time to humanitarian and educational causes. She is a believer, a woman who answered her calling and mastered the courage to respond to her visions even though she knew people might not always understand things she had to say. She believes in the power of the womankind. “They are the present and the future”, she emphasises. Women will go on to build a new future, she believes. A future “vastly different from today”. She talks about how and why women should support and encourage each other. “By supporting arts and healthy families which helped civilisations hold together for thousands of years we will make a happier woman, a happier wife, a happier mother, and a happier citizen of the society. In turn, we will make more giving communities, and more peaceful countries”, she mentions in her parting notes. 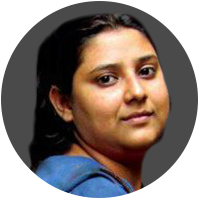 Srimoyee Pandit is senior producer at WION. She devours delicacies and books alike. And she absolutely loves life's little surprises.